LOOKING FOR HOTELS IN BARRI GOTIC? Home » LOOKING FOR HOTELS IN BARRI GOTIC? 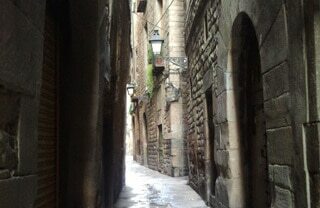 The Barri Gotic hotels in the oldest part of Barcelona are full of undeniable charm… If you like narrow alleys and corners full of history, you might want to consider staying here! Staying in El Barri Gotic (Barcelona) you’ll be walking distance from La Rambla, the Born district, the fishermen Barceloneta neighborhood and even the shops and Gaudi apartment buildings in Passeig de Gràcia. The downside is that sometimes its backstreets are pedestrian areas or so narrow that taxis can’t really drop you in front of your hotel, then you’ll have to be ready to walk a couple of blocks. But if that doesn’t scare you, then the Barri Gotic hotels offer you the pleasure of silence and the charm of the medieval atmosphere. 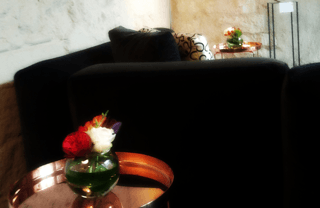 The hidden gem of the hotels in Barri Gotic. It is located inside a restored medieval mansion, in an alley that tourists haven’t discovered yet (although it’s only a couple of blocks from the Cathedral). Not many taxi drivers will accept to take you down such a narrow alley, but in exchange you’ll be offered elegance, exclusivity and privacy. That’s why it’s often chosen by local celebrities. A Relais Chateaux in the medieval Barcelona! Romantic and private, I L-O-V-E their rooftop terrace (open to non-guests as well for drinks in the evening). Same down-side: some taxi drivers will refuse to drop you at the door, as the alley where it’s located is quite narrow… They can however get you close enough: just one block from it. Modern and convenient, it is located in a side street around the corner from the Cathedral. Unlike most other Barri Gotic hotels, this one doesn’t have any special charm, however it has anything you’ll want for a 4-star hotel for an affordable price. Plus taxi drivers should be able to drop you at the door, no problem. Hotel with an old-fashioned Parisian touch, for those who like old-school venues. It’s located right in front of the Cathedral, somewhere accessible by taxi. BTW, don’t be put away by the hotel name: in Spanish it actually means “Columbus Hotel” (lol). Located halfway between the Cathedral and La Rambla, in the edge of the Gothic Quarter. Modern and comfortable but without luxuries, you’ll enjoy walking around the animated streets and plazas around it. AND BONUS! This is our latest discovery! 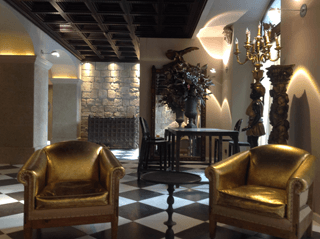 This mansion from the 1700’s has been accurately restored and transformed into a luxury boutique hotel that has quickly become a favorite among all of the hotels in Barri Gotic. Gorgeous rooms, some of them large enough for families or including a kitchenette where you can prepare your meals with the fresh produce you’ll buy in the nearby Boqueria Market. It’s accessible by taxi and located half way between La Rambla and the Cathedral, in an area offering plenty of unique shopping options. Hotels in el Born district are our favorite alternative to hotels in Barri Gotic. What about you? Go to the comments and tell us, would you consider Barri Gotic hotels for your trip? LOOKING FOR A HOTELS IN EL RAVAL? LOOKING FOR HOTELS ON LA RAMBLA?